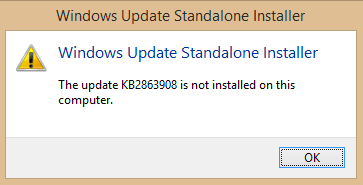 But this has proven only to be working if the KB is related to Windows, else you will be getting this error: The update is not installed on this computer. Thank you so much for this. It was driving me nuts that wusa.exe was saying it couldn’t find the update KB3114409 when the GUI clearly showed it was there. Hi, i have this problem 🙁 and i really need to uninstall an update, but i don’t understand how to find the key in the registry :(, can you help me? Amazing. I couldn’t get this done in WUSA or DISM, but this did the trick. Great find. Thanks!